Editor’s note: This is a guest post by Iris Shoor, a co-founder at Takipi, a new startup looking to change the way developers work in the cloud. Previously, she was co-founder at VisualTao, a B2B startup acquired by Autodesk. This article was originally published in Hebrew by Newsgeek. Marketing is not just about picking the right strategy, or having the perfect positioning, it’s also about small tactics – increasing daily downloads one small step after another. This is the short and extreme plan or, in other words – the cheat sheet. 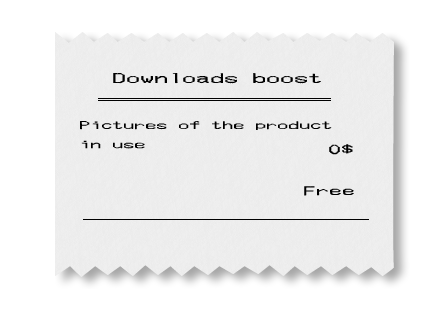 These are seven quick, cheap and easy to implement tactics that helped us increase downloads. On our journey to bringing AutoCAD WS from 0 to 10 million downloads, the small things were as important as the overall strategy. 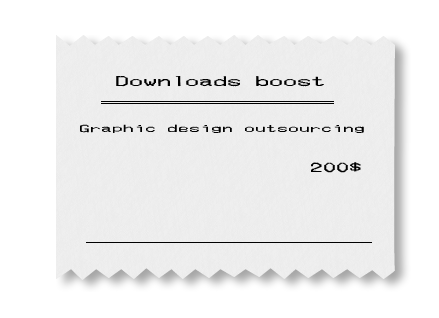 Each one of these tactics helped us (and other companies) increase our downloads by about 0.5 – 5%. God is in the details – and so are download rates. Whether the app itself is localized or not, localizing its description in the App Store/Google Play helps you reach more users by organic search. 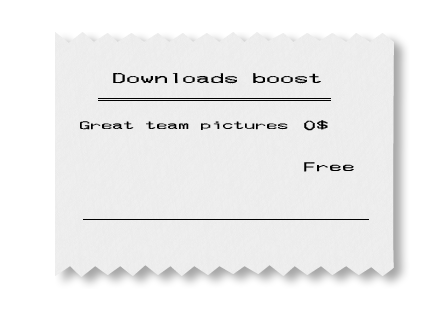 It also increases the chances that users who reach your app page will end up downloading it. We used online human translation which worked fine for us. 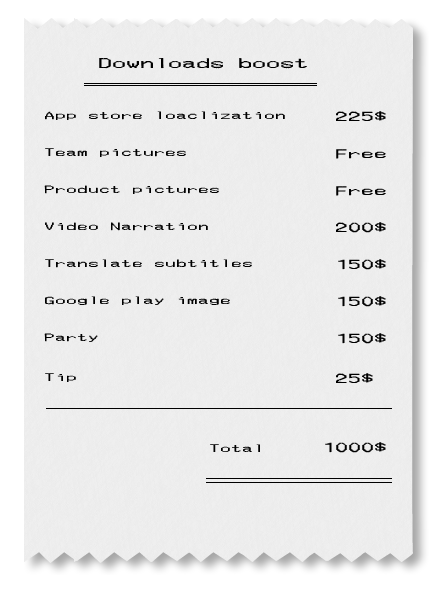 A pretty long description cost us about $75 per language. My top picks are Spanish, Chinese, Japanese, Italian and Korean. 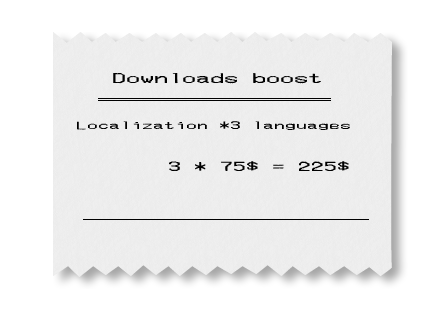 Once you’re done localizing the description – localize the content in the screenshots that appear in the App Store/Google Play. For example, the contacts list should display names that are typical to the language (you won’t find a ‘John Smith’ in an Italian contacts list), social networks should use feeds in the right language, maps should show the right country. Examine every text object in your screenshot and adjust it (read more about how to localize your marketing here). Bloggers love using these pictures. By providing them you can increase the traffic that is likely to come from the blog. If you’re a part of a large company, use pictures of as many employees as possible, but not together, please. Enough with “100 people standing on the stairs” pictures. Try to have max 6-7 people in a picture at a time. The employees themselves will probably share the (cool) pictures as well and drive some more traffic. Don’t use illustrations of the team. Although it sounds like a good idea (and in general I love using illustrations),when you want to show real people and have your audience relate to your team members – use real images. Try creating contextual images which are aligned to what your company does. 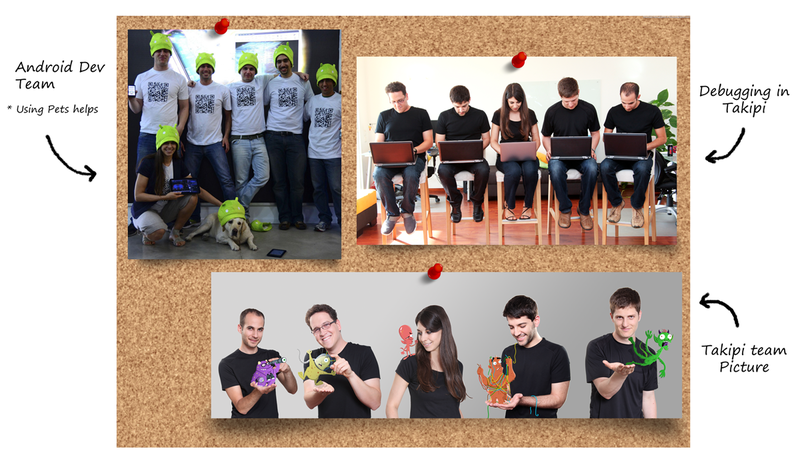 Here are a few examples which worked for us – launching the Android app (at Autodesk) and two contextual team pictures of Takipi (my current startup) – “Shhh, we’re debugging’ (that’s what Takipi tries to solve) and a picture of us with our ‘monster’ bugs. Although Apple created the ‘screenshot’ language, when they show their products they never use a plain picture/ screenshot – they show how people use it. It’s all about the feeling of using the app/ product. 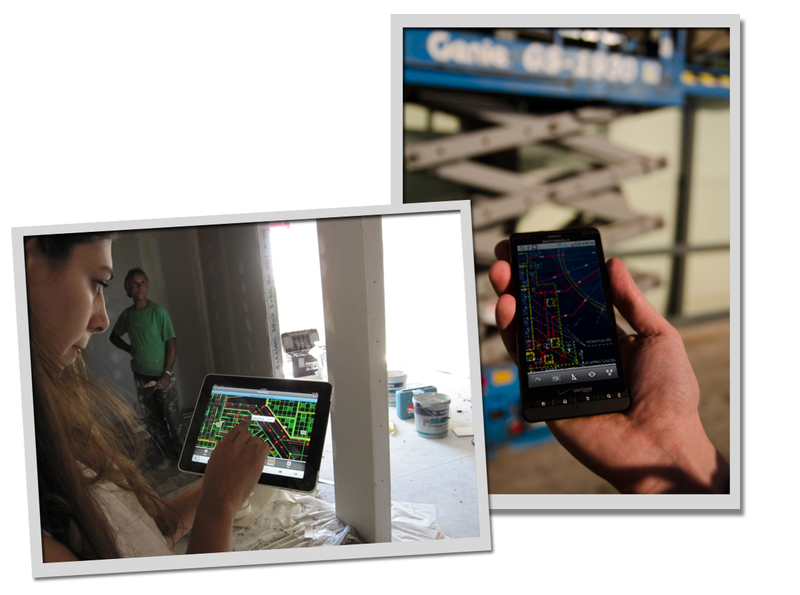 Give your users a clear picture – are they going to use the app outdoors, at the office, in the kitchen? During the day or at evening time? In a crowded place or by themselves? Once we started showing our app in context we got a better conversion rate (equals downloads) coming from our website and these images were also more likely to be used by the press. Most companies tend to focus on producing a marketing video (great decision, I’m all for it) but sometimes neglect a basic ‘getting started’/ ‘How to’ video. If you don’t have a 2-3 minute video which demos the basic workflow – now is the time. While filming the video is a relatively easy task (tape an iPad to a table, fix a home camera or your mobile on top of it and look for someone with a nice pair of hands) achieving good sound quality is much harder. I recorded the video with a voiceover and then sent it to a professional narrator. There are dozens of different web services where you can choose the voice you like and once you send an existing file there is hardly any room for mistakes. It’s also easy to SEO these videos and they are likely to appear high in the search results = more downloads. We never even thought about video localization until we noticed a video demo-ing our app, uploaded by one of our Spanish-speaking users, gained more than 10,000 views in a few weeks. There are two options to reach a wider audience of non-English speakers. 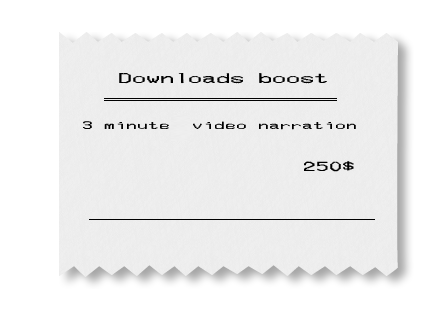 The expensive option is to record several versions of the narration and to upload the outcome as different videos with name, description and tagging in the same language . We did just that with Mandarin and Spanish and it worked great. 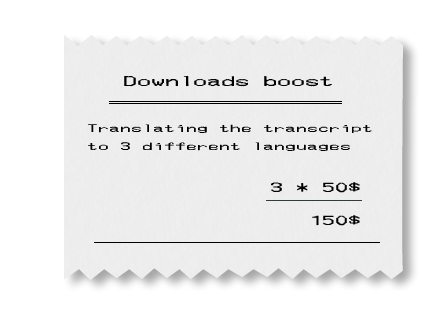 A less expensive way is adding subtitles. In YouTube, it’s five minutes’ work (after translating the transcript) and it is definitely worth it. You can upload the video several times, under different names in different languages with the correct subtitles as a default. Once you upload these videos to YouTube link to them from the same language app page in Google Play (for example, the video in the Japanese store will have a Japanese name and Japanese subtitles). 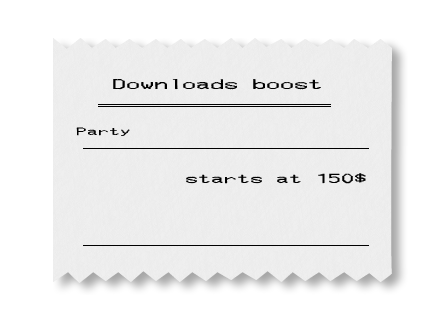 More people will watch your video = more downloads. I recommend starting with Chinese, Japanese and Korean. These are huge markets with users who don’t usually consume English language videos, even with minimal voiceover. 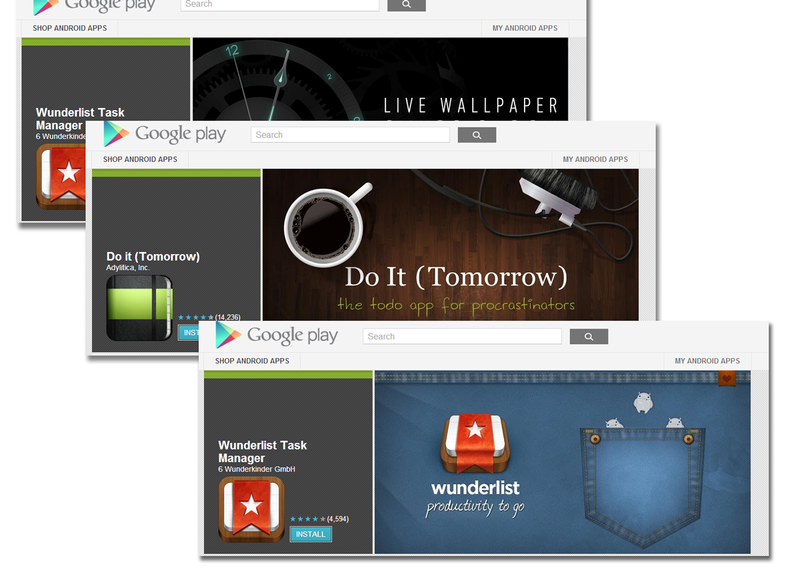 When it comes to Android apps, your app page image on Google Play will be the first and the largest content your potential users see. This is the place to be unique and interesting. I always try to imagine what my potential user is looking for. An approach which worked well for us is combining ‘Andy’ with our world, stating what we do in the main image by using a funny image of Andy. Don’t use your logo (even if it’s great, I’m sure it is) or screenshots, you want to make sure users scroll down to the screenshots or, better yet, hit the ‘install’ button, located right next to the image. 7. Let the party begin – celebrate something, anything. The launch, a new version, a new website, hitting a milestone or the product birthday. Make it fun and more importantly – make it look fun. 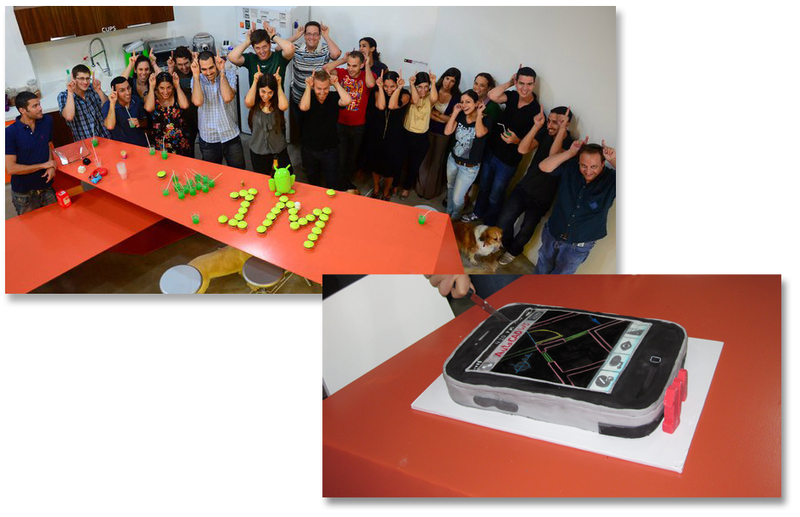 We had a cake in the shape of our app, green Android cupcakes, 1-year-old hats. I’m not sure about the psychological explanation, but when you party, people party with you. Pictures of these events were the most liked/shared content on our Facebook page, and were also among the bloggers favorite content (X celebrates Y downloads with beautiful pictures – you nailed it!). Take extra care with the visual content, a simple toast in a small conference room or a picture of your team in a restaurant won’t make it. Your content should be in the context of what you are celebrating.